The Washington High School winner of Altrusa International’s second 2018 scholarship, Savanna Davis (center), is pictured with, left to right, Altrusa Foundation Treasurer Alice Craig; mother Heather Robinette; Savanna Davis; father Derek Davis; and Altrusa President Elaine Crutcher. The Washington High School winner of Altrusa International of Washington C.H.’s second 2018 scholarship was introduced at the club’s July 5 meeting. Spring graduate Savanna Davis will be leaving in August for Marshall University, where she plans to major in chemistry, with a final goal of being accepted for pharmacy school. Active in a variety of fields while at Washington High School, she may play intramural sports—in particular, soccer—while giving the most serious attention to her academic studies. The local Altrusa club awards annual scholarships to two outstanding female graduates of Fayette County’s public high schools. Miami Trace’s 2018 winner, already announced last month, is Brooke Heinz; last year’s winners were Samantha Ritenour and Anna Nestor; and 20 years ago, Jill Craig and Becky Wyatt. The funds for the scholarships are raised partly at the autumn tasting luncheon known as “Loving Spoonsful.” A limited number of tickets will be available in early September for this year’s luncheon, scheduled for Saturday, Oct. 27, at the Commission on Aging. 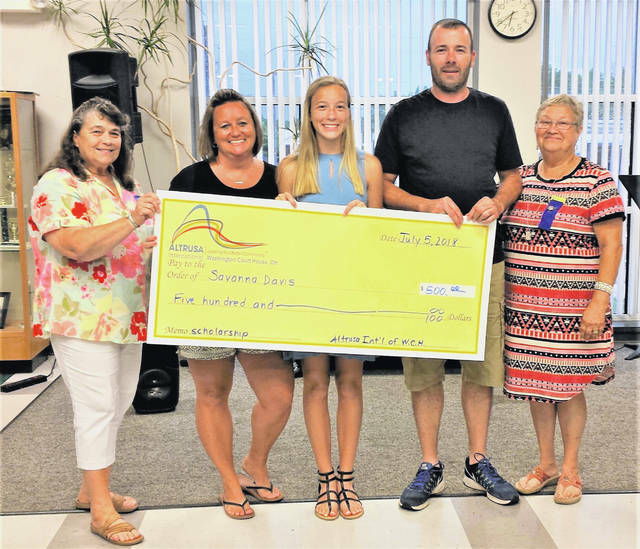 https://www.recordherald.com/wp-content/uploads/sites/27/2018/07/web1_ALT-2018-WCH-scholarship-w-family.jpgThe Washington High School winner of Altrusa International’s second 2018 scholarship, Savanna Davis (center), is pictured with, left to right, Altrusa Foundation Treasurer Alice Craig; mother Heather Robinette; Savanna Davis; father Derek Davis; and Altrusa President Elaine Crutcher.